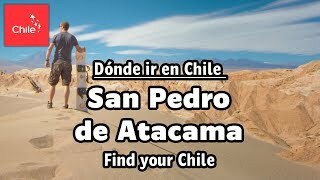 San Pedro de Atacama is located 2.500 mts. above sea level, on the north side of Atacama Salt Flat, an area of great tourist and archaeological attractions. The town is set on one of the many oasis formed by the rains of the "Bolivian Winter" in Atacama Desert, the driest in the world. That's why you can see truly unique vegetation, like chañares, carob trees, and capsicum. The area was the main development center of the atacameño culture, and then a scouting party for the Incas. You can take a look at the historic past of San Pedro de Atacama in the Archaeological Museum Padre Le Paige in Quitor Pukará and Tulor Village, near the town. You'll feel transported to another time when you go through the cultivation fields and visit the traditional adobe houses. But it's not all archaeology. The surroundings of San Pedro de Atacama also offer various attractions and unique landscapes that have been formed due to the extreme conditions of the area (lack of water, volcanic activity and the presence of salt flats). The Cordillera de la Sal (Salt Mountain Range) will surprise you with its Moon Valley and Tatio Geysers, which are a spectacle that not even mountain sickness can spoil. Also, Los Flamencos National Reserve is a display of the varied fauna that inhabits this hostile area. Finally, the towns of Toconao and Socaire show the lifestyle inherited from the ancient peoples. Within San Pedro de Atacama, there is a great variety of places to taste, like the typical Atacama food, pizzas to the stone or even different vegetarian option that use the vegetables and more typical vegetables of the zone. There are few ATMs in San Pedro de Atacama. You have to consider that the demand for these ATMs is high, so they don’t always have money. We advise you to bring some cash with you. We went to one of the pukara more careless of the North of Chile. It's Turi, a small town of the Atacama culture dating from 1250.